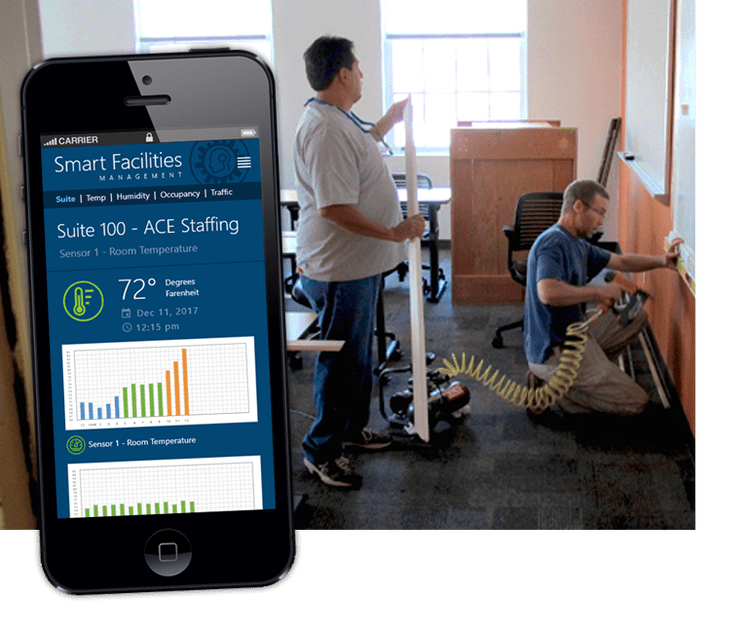 What would take a building from simply “smart” to fully “sentient?” Smart involves the instrumentation of core systems to provide sensing and actuation that optimize the operations of the property. Sentience takes this a step further, using the building’s smart capabilities to minimize human involvement in ongoing operations and free the building to promote, populate and operate on behalf of its owner. To move beyond smart, a building must acquire the ability to negotiate contracts, manage payments and perform predictive and reactive analytics on its own state. It can access data from the external world and from peer buildings in order to expand its awareness beyond the property and to pull in knowledge and best practices that allow it to adapt, changing its economic or physical environment. It can recruit and manage the service providers who handle everything from marketing vacant units to cleaning bathrooms to repairing a damaged roof. All of these services are then contracted using online advertising, smart contracts and sensors to confirm completion. An instrumented space can calculate historical correlations between measurements of occupancy, outside temperatures, ambient lighting and tenant behavior to forecast the energy needs of a building in the future. Forecasts measured against actual usage can lead to cost savings by allowing the building to actuate down from higher predicted use or actuate up to satisfy tenant expectations. In large organizations, this also allows for commodity hedging, a practice common in the airline industry whereby futures contracts guarantee stable prices for a year or more, reducing price volatility and financial risk. Energy exchanges exist for natural gas and electricity that allow for the payment of a futures price based on a specified volume and period of delivery. With data, energy buying can be timed to maximize savings without sacrificing comfort or requiring massive manual analysis. This will drive more and more buildings to participate in their local energy markets. Buildings equipped with electric generation capabilities through solar panels and contingency generators can put these dormant assets to work to generate energy and revenues during building downtimes. By joining together with smart grid deployments, excess energy can be sold back to local microgrids to create revenue and provide resilience and capacity to local electrical grids. Contributing data related to capacity, readiness and demand allows a building to seamlessly participate in smart grid initiatives that help in both the consumption and generation phases of electric distribution. A fully sentient building will track the lifecycle of all its components, correlating events and correlated data to predict optimum preventative and restorative maintenance schedules. By integrating with a network of maintenance providers, the building can proactively maintain these components in the most cost-effective way — based on the availability of parts and labor and avoiding high-cost peak periods in exchange for vendor discounts. With multiple relationships in place, a marketplace for the services can be created to solicit bids dynamically and award work based on cost, timing and effectiveness. This approach can be applied to routine maintenance of core building systems like HVAC and fire suppression, or episodic upgrades to core assets like roofing and asphalt. Landscaping can be planned based on weather conditions and the needs of the specific project using the data collected from soil and sun sensors. This allows tasks such as lawn care, watering, leaf blowing, fertilization and pruning to be timed to the needs of the landscape architecture and balanced with the availability of landscaping services. By contracting for services only when necessary, a building can balance indoor/outdoor landscape environment for cost and aesthetics. Data from sensors that measure such information as foot traffic, external weather, supply inventory and historical conditions can focus on cleaning efforts when and where they are needed, eliminating redundant or unnecessary deployments of your staff and equipment. Integrating with procurement processes can also optimize the availability of cleaning materials to coincide with the performance of cleaning duties and availability of supplies through the supply chain. Minimizing over-ordering can reduce theft and minimize storage needs. 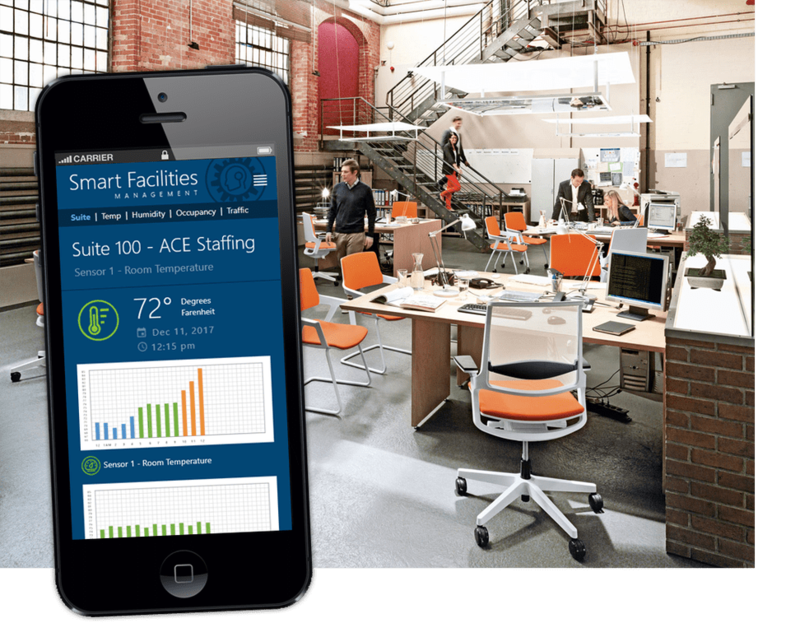 Smart buildings can identify events that correlate with high and low usage patterns for tenants. By providing visibility to areas of overflow and underuse, the sentient building can allow common areas, recreational facilities and other spaces to be reconfigured to suit actual activity (even evolving activity). This, in turn, will increase tenant satisfaction and create incentives to extend leases. Making common areas more accessible and able to more effectively predict overflow can increase their value in the minds of tenants, justifying increases in common area maintenance fees and ensuring that the space is used productively. Buildings that feature retail space will greatly benefit from metrics that can demonstrate the superior business value associated with a specific space. Foot traffic figures that show traffic patterns can help predict purchase volumes by combining historical traffic data with retail performance metrics from retailers. This can enable a net present value of one space versus another and a new tool for marketing and justifying leasing rates. This can also allow retailers to track the performance of marketing efforts to drive traffic which provides a valuable service that the building could provide to retail tenants. Buildings where people live, shop and work can impact the wellbeing of their occupants in positive and negative ways. The negative impact of so-called “sick buildings” on human health has been well documented and even litigated. Now it can be quantified and mitigated, too. A sentient building can measure air quality, occupant activity and the performance of core systems like plumbing, waste and HVAC to correlate the activities and conditions that maximize the health of human occupants. 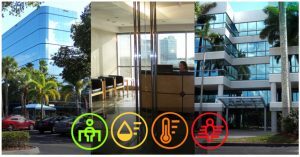 It can actively move to improve environmental conditions, creating incentives for occupants to use health facilities or take the stairs rather than elevators, thus creating financial incentives to attract and retain healthy tenants. Connectivity to health and home insurers can allow the building to feed into wellness and occupational health/safety programs to create mutually beneficial relationships. Discounts can reward tenants for positive behaviors and demonstrably reduced healthcare costs or safety risks. Healthier tenants make for better business partners because they chose to stay and participate in the healthy building environment. When people have choices, the sentient building can balance their activities to save money and generate revenue with the tenant experience. To do this, it is critical that human sentiment be measured continuously in multiple dimensions. When humans are happy and proud of their environment they behave differently. The building can integrate this data and quantify these behaviors. For instance, tenant social media feeds can be analyzed to determine satisfaction or dissatisfaction with particular building attributes. The radio of those working from home versus those working on-premises can determine which tenants warrant extra attention that can translate to improved productivity. The rate and activity of visitors to the site can be used to gauge whether tenants are inviting personal and business associates into their environment routinely. Shifts in these metrics can provide insight into the impact of operational programs and special events. Once instrumented and activated, a sentient building can operate self-sufficiently without the need for a large staff to manage operations. A small set of expert troubleshooters and auditors can replace the army of managers and low-skilled support staff that typically operate conventional facilities. These experts can ensure that the sentient building operates effectively and efficiently and help to manage extraordinary needs that might arise. A sentient building demonstrates the actual needs for services based on historical prediction and on real-time awareness to eliminate guesswork from service provision. Sentient buildings are empowered to negotiate for the best service and the best price which opens up opportunities to displace incumbent providers and expand those service vendors with efficient operations. A sentient building is an active partner in optimizing your daily interactions, whether they involve working, shopping or living within its walls. The sentient building uses real-time knowledge to tune the environment and manage costs which will maximize your experience. It allows you to plan for your needs and optimize your leasing expenses. Dashboard overlays can present historical occupancy with weather and calendar events (weekends, holidays and company events) to demonstrate impacts on energy consumption. Predictive tools can use future weather forecasting and scheduled events to predict energy needs. Robots can monitor energy markets for pricing fluctuations that trigger alerts (via email, SMS and push notifications) to prepay for an appropriate block of energy or trigger electricity generation with a single click of the “Approve” button. Savings up to 40% of monthly energy bills can be had with smart actuation and predictive pre-purchase. Dashboard overlays can present historical foot traffic and air quality measures with weather and calendar events (weekends, holidays and company events) to demonstrate correlation of impacts on cleaning needs. 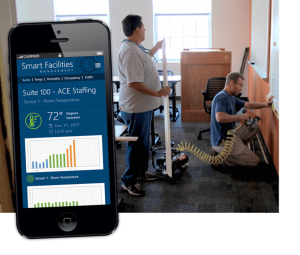 Predictive tools can use occupancy and weather forecasting to predict cleaning demands to drive staff scheduling. Robots can generate smart contracts with sensor-measurable service-level agreement criteria to solicit bids from three different cleaning vendors to contact for service and pay based on measurable performance. 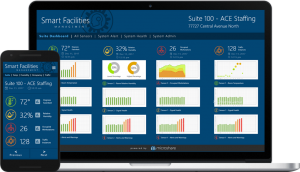 Alerts can be generated for the vendor management when SLA violations are approaching. Month-end performance reports can be fed into smart contracts to trigger appropriate payment based on predetermined SLA performance. Savings up to 30% are available by reducing the ambiguity of cleaning schedules and introducing claw-back terms for SLA violations. Dashboards can correlate foot traffic with historical receipts to show the value of a given space versus the predicted performance of competitive spaces. A prospective tenant can use a wizard to model their business and forecast business with a revenue/week view based on historical and projected volumes. Smart lease contracts can be created to manage variable payments based on the performance to the projected business volumes. Improving tenant satisfaction will create a 15% premium for space based on pay-per-performance metrics. Integrations with health insurance providers can allow tenant companies to demonstrate the healthy behaviors of their staff and the overall health of the working environment, generating discounts along the way. Historical trends of a company can be overlaid with the performance of other companies within the building or similar buildings to gamify wellness by creating competitive views of healthy activity. Use of health facilities, internal stairs, bicycle racks and in-house kitchen facilities can demonstrate measurably beneficial behaviors that indicate thresholds necessary to achieve a monthly discount. Health insurers already awarding discounts and health club incentives can focus financial rewards on companies that actual practice good health. Televisions in the lobby can display the competitive results of the wellness programs by floor and/or company. Dashboards can show managers and employees what behaviors are necessary to achieve discounts. Company health care costs can drop by 25% by encouraging healthy behaviors that impact the quality of the group and draw discounts from insurers. Healthy employees are 15% more productive than unhealthy employees. Visitors can be encouraged to use their social media feeds to post about their visit to the sentient building. Dashboards can show the new information measured against historical visits, social media mentions and social media sentiment in real time to show an overall metric like net promoter score. Activities of the moment can be highlighted to recommend start/stop/continue activities to positively impact the direction of sentiment. Sentiment changes can be charted against current building conditions like cleanliness, warmth and occupancy to see how routine operational decisions may be impacting tenant attitudes. Pride in the environment is the strongest predictor of lease renewal. Commercial and residential tenants that are measurably happier with their environment drive a drop in costs associated with empty spaces — in some cases as much as 75%. Sentiment is a critical indicator of financial performance over time.